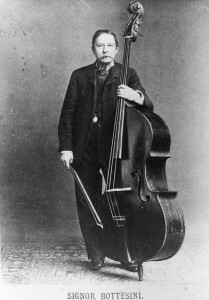 Giovanni Bottesini,born in Crema in 1821, was a double bass player, conductor and composer. Coming from a family of musicians, he began his musical studies with his father, Pietro, a clarinettist and composer. He gained a diploma from the Conservatory of Milan in 1839. During the second half of the 1800s, this Maestro reached the highest level of success and fame throughout the world to which a person of that era could aspire. His first significant concert as a soloist was held when he was just 7 years old at Crema’s Teatro Sociale in front of an audience dumbstruck by such talent. Still today considered the greatest double bass player who ever lived, so much so as to merit the title “the Paganini of the double bass”, Bottesini gained wide acclaim in America, Europe (particularly in Italy, France, England and Scotland), but also in Russia and Egypt. Among the cities which witnessed this protagonist of numerous successes were Naples, Palermo, Milan, Turin, Madrid and also Paris, London, Buenos Aires, Havana and Cairo where, from 1871 to 1877, he took on the conductorship of the Teatro Regio and where, on 24 December 1871, he conducted the Premiere of Aida at the inauguration of the Suez Canal. In the United States he was so popular as to merit a dedication of a Hollywood star, reserved for the nation’s most illustrious personalities. But Bottesini was also a prolific and original composer, mastering all musical genres. He wrote 7 successful lyrical operas, but what most captured the enthusiasm of the public, enough to merit a good 23 replicas, was “Ero e Leandro”, named to a libretto by Boito, performed for the first time at Turin’s Teatro Regio in 1879. In 1888 he was appointed the Director of the Conservatory of Parma, and it was here that he died in 1889. The Maestro still lies in the Conservatory’s chapel, which is dedicated to him. His Metodo per contrabasso was published by Ricordi and is still today studied by double bass players across the world.